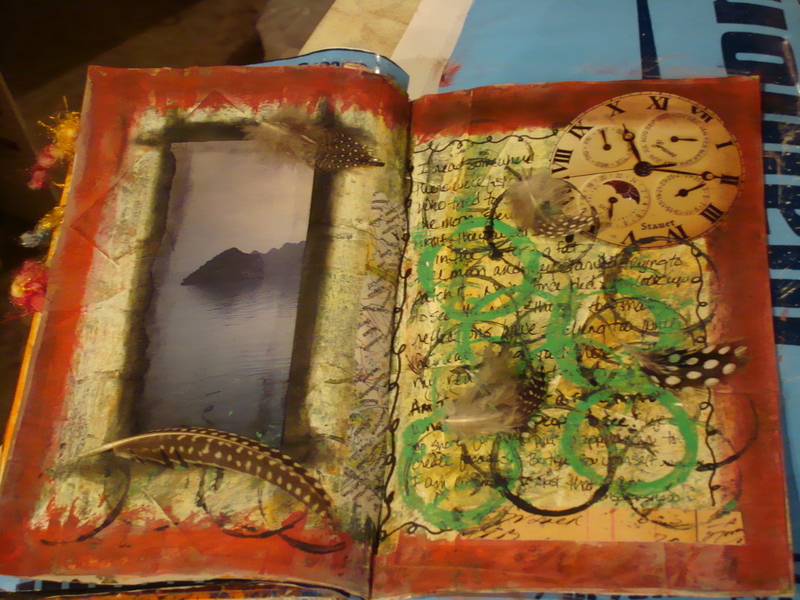 Here’s a page I came up with in my repurposed book. Lots of layers here, which means I should be cutting out more pages than I am to keep it from becoming too bulkly to close. I could put some sort of closing method on it – and I might – after it’s finished. This caused me more than a bit of angst. Why? Because I love this orange ink. Love, love, lOVE it! And it came from the only art store around (that I know of – I know the internet tells me there are two more but both are a bit father away and in/near downtown Milwaukee and that is a p.i.t.a. to get to, but I digress). And while this store isn’t hard to get to, they are iffy when it comes to having things stocked. When I found this fabulous orange ink, I was really looking for yellow – I have yet to find yellow. The shelf has a spot for it, but it’s always empty – as are most shelves. I know it may be due to kids coming in and shoplifting. But really – I can never find help until I wander by the Golden Acrylics section where I am promptly pounced on by employees kindly saying how Golden is for “professional” artists in a tone that indicates that they would believe that pigs could fly before I could possibly be an artist. Not all of them are like that. Just a few. There is one woman that works there that has the most fab frames on her glasses and almost seems like a work of art herself. She’s always VERY good at listening and helping me find things that I need. Too bad I run into the others more often. But again, I’m off the path. The point is, I’ll go back to the store, look for the ink, then stand in the Golden aisle until I’m approached and pray that they have a bottle in the back. 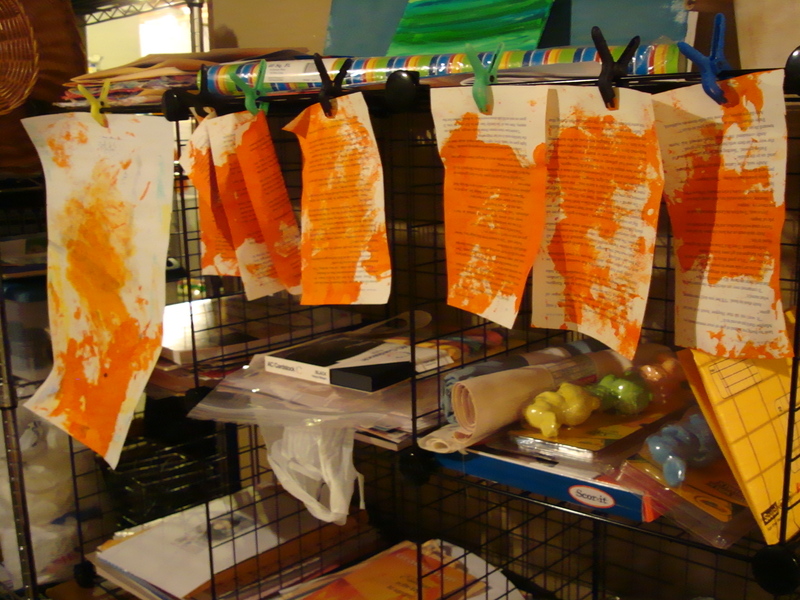 In the meantime, I have my orange pages floating around and I swear one of them told me that I should grab the forest green ink and add a few dribbles – or maybe stamp a few things…. I don’t mind accidents like these too much – not when the end result gives me more opportunities to create!